Changsha Huanghua International Airport is at Huanghua Town, 25 kilometers (15.5 miles) to the city center of Changsha. As the largest and best-equipped airport in Hunan Province, Changsha Airport is also famous as one of the top 20 busiest air hubs in China. Currently, it has two terminal buildings, T1 and T2. T1 was built in 1986 and enlarged in 2000 to cover a building area of 53,000 square meters (13.1 acres), is capable of handling 4,600,000 passengers every year and 1,890 at peak hours. T2, with a designed annual throughput of 15,600,000 passengers, was officially opened on July 19, 2011. It covers an area of 213, 000 square meters (52.6 acres) in total, ranked fifth nationwide. Currently, the airport has a 3,200-meter-long (1.6 miles) runway and a taxi track of the equal length. It is also equipped with such communication navigation systems as ILS, VOR/DME, NDB and advanced ground security facilities, which enable it to handle Boeing 737, 747, 757, 767, 777, 778, A300, A320, A330, A340, and MD82, and MD90, etc. It has over 110 scheduled flights to 81 cities domestic and international, such as Beijing, Guangzhou, Shanghai, Xi'an, Hangzhou, Sanya, Nanjing, Chongqing, Xiamen, Kunming, Hong Kong, Macau, Seoul, Bangkok, and Kuala Lumpur. The 72-hour visa-free transit policy has been implemented at Changsha Airport since January 1st, 2016. Passengers from 51 countries or regions can enjoy this policy when transiting in the airport. Read more about 72-Hour Visa-Free Transit. Notice: The Airport - Helong Stadium Line is suspended from Jan. 20, 2014 and the future operation time will be noticed further. Nowadays, there is convenient medium-low speed maglev train that can directly take passengers to Changsha South Railway Station. They are available at 09:00 – 18:00 at intervals of 24 minutes. The duration is around 20 minutes. It costs CNY 20 per person. Airport → Xiangtan Xiangtan Civil Aviation Ticket Office 09:10, 10:00, 11:00, 12:30, 13:30, 14:30, 15:30, 16:30, 18:00, 19:30 CNY42 80 mins. 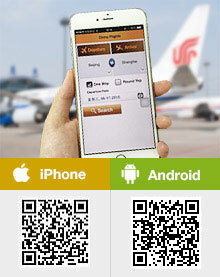 Airport → Pingxiang Pingxiang Oriental Hotel 10:30, 12:30, 14:30, 16:30, 18:30, 20:30 CNY84 130 mins. Pingxiang → Airport CSHHA (arrival exit of Terminal T2) 06:30, 09:30, 11:30, 13:30, 15:30, 17:30 CNY84 130 mins. First-Aid Medical Center: in the section A of the Departures Hall; in the Remote Boarding Gate in the Section C of the Departures Hall; behind the No.3 luggage carousel in the inner Arrivals Hall. Nursery Room: at either end of the Departures Hall; in the sections A, B and C of the Departures Hall; in the outer Domestic Arrivals Hall; in the International Arrivals Hall; at either end of the inner Domestic Arrivals Hall; and in Remote Boarding Gate in the sections. Luggage Trolley: along the viaduct outside the Departures Hall; in the corridor A, B, and C of the Departures Hall; in the International and Domestic Arrivals halls. Self-Service Check-in Machine: There are 24 Self-Service machines in front of the check-in counters of sections A, B, and C in the Departures Hall. Dressing Room: Three dressing rooms are located on either end of the Domestic Arrivals Hall and in the International Arrivals hall. Luggage Packing Counter: Two luggage packing counters are available in front of the check-in counters of sections B and C in the Departures Hall. Inquiry counter: west of the check-in counters section A, B, C & D and Quarantined Zone Section B of the Departures Hall in T2. Business VIP Services: It provides a series of distinguished services for passengers, including check-in procedures by service staff, exclusive security check passageway, special escorting and comfortable rest rooms, at the Business VIP Lounge of Terminal 2. Is there any airport taxi available to take me to Viena Hotel at Changsha Kaishun Road? How long does it take to explore Orange Isle and Hunan Provincial Museum? Is it advisable to linger in the Changsha airport after arrival at the airport at 9.30 am before checking in for outbound flight at 5.30 pm? Does the airport organize half-day city trip for transit passengers? Generally speaking, the suggested sightseeing time of these two scenic areas is half day. You can make full use of the time to visit one of these two attractions because you need to go back to the airport at least 2 hours in advance before the departure. Upon landing, you are advised to consult the airport staff and see whether if they provide such half day tour. Thank you for informing me it takes half-a-day at least to explore Orange Isle and Hunan Provincial Museum. They are certainly huge. As far as my research shows, the airport does not have half-day city tours for transit passengers. It is its plan to do so only as it is still liaising with the city tourism authority to organize free half-day city tours for transit passengers. I will just experience Maglev rides and leave early for Haikou during lunch hour. Where can i go from Changsha airport between 9.30 am and 5.30 pm? I arrive on a weekend at airport from Haikou at 9.20 am and i have to check-in to the flight to Haikou at 5.30 pm on the same day. Where can i go from airport between these timings? Are Orange Isle and the Hunan Provincial Museum worth the visits on a weekend? How about short return flight to Dayong airport of Zhangjiajie for aircraft-spotting at 11.40 am? Does Airport allow aircraft-spotting photography outside the terminal building? 1. It is available to visit Orange Isle and the Hunan Provincial Museum but remember to get back to the airport 2 hours in advance. 2. I'm not sure about that and you can verify if it is available with the staff of the airport. I am traveling from Zhangjiajie to Changsha, then from to Xi'an. They are two separate flights (not just a layover). The time between the two flights in 1.5 hours. My question is, is that enough time? Also, will I need to pick up and recheck my luggage or is there a way to send it straight through to Xi'an? Well, generally speaking, the time is tight. You are suggested to leave 2.5 to 3 hours to make this transfer. If the two airlines have luggage check through service, you don't need to pick-up and recheck the luggage. And your luggage will be delivered to the destination. from China Southern airline. We are both coming from different countries, will we be able to meet at the same baggage claim area? Well, I am not sure. But generally speaking, you will arrive at the same baggage claim area. In order to be sure, you are advised to consult your airline about this question.